Discussion in 'WMSTR PROJECTS' started by wifyan, Jun 24, 2010. Anybody who's looking for something to do this weekend is welcome to come to the hitterdahl depot. 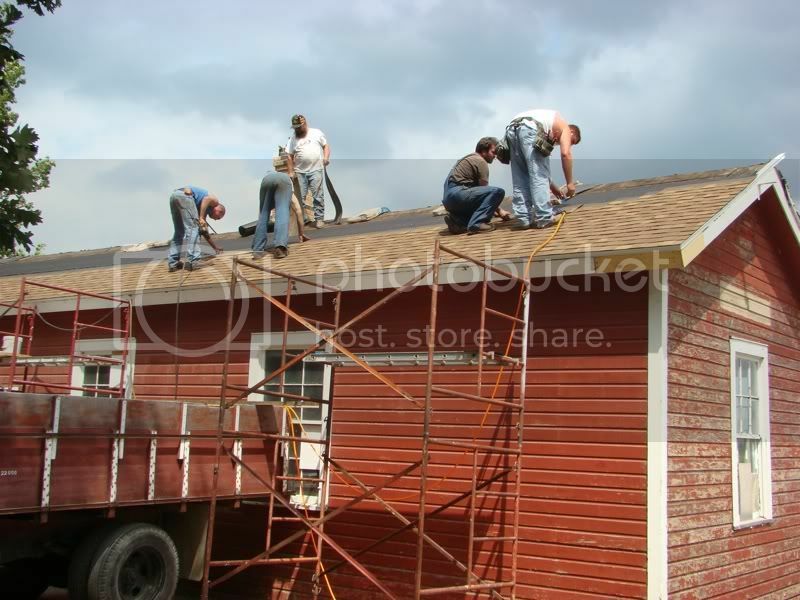 We will be shingling (depending on weather), and have some facia work to do to the building. 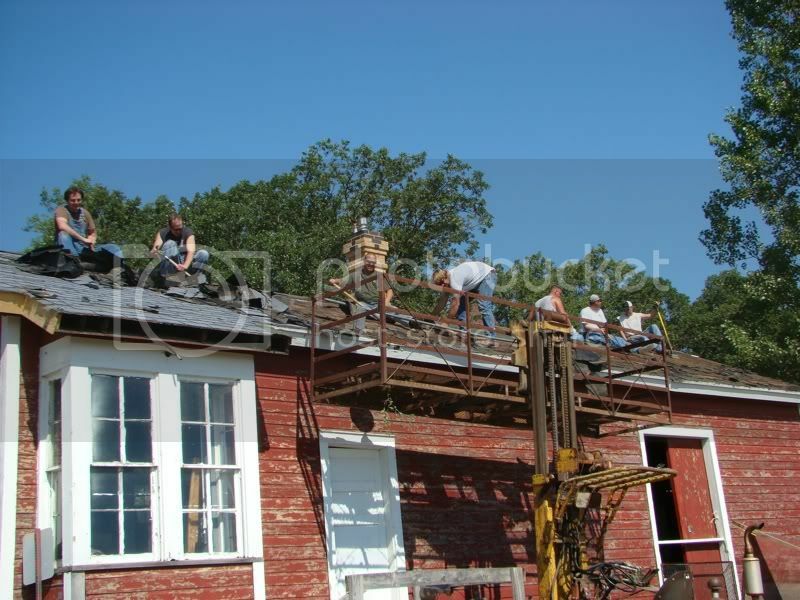 We'll be looking for help with shingling, clean up, and aslo to finish the facia work. I am sure that Yancy, Jon, or someone will have some better pictures to contribute here, but I just have to share a couple. After a false start last weekend (Rain!!!) Yancy hit her hard this weekend... (95˚!!! but no rain). Not sure who was all involved in tearing the west side of the roof off as I was unable to help them in the morning, but this is what went on after lunch when I was around to help them out! Was it ever hot up there! This is the east side, as yet untouched. Yancy did not want to start tearing it off because of the threat of storms (which did happen Saturday night) and he needs something to do next weekend! Here is one for the ladies!!!! Yancy will be along here shortly to give credit where credit is due, and to let us all know when part 2 will be scheduled! BTW... it is not a bad roof to work on! Easy pitch, and not too big, so if you are a novice, this roof is for you! 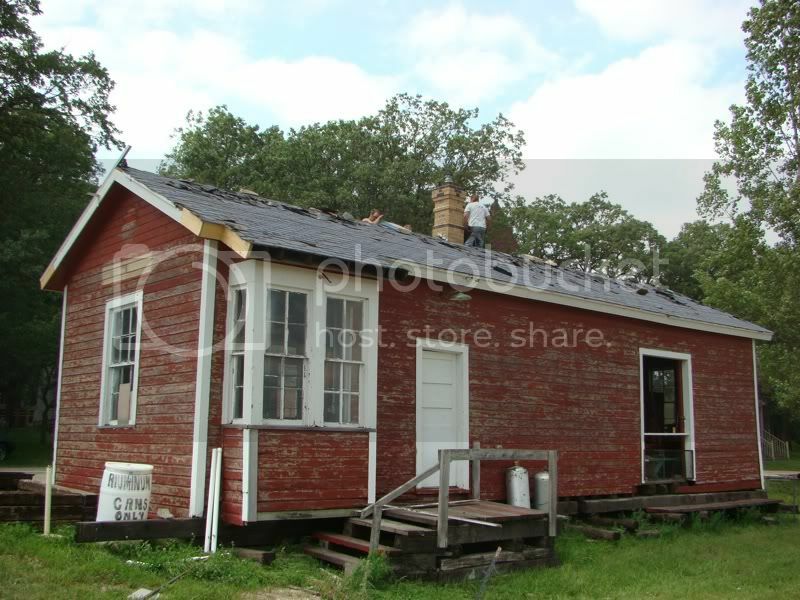 It would be great practice for the Baker Depot which is next on the list! Oh my god!! I almost lost my lunch!!! That picture of Josh is funny! 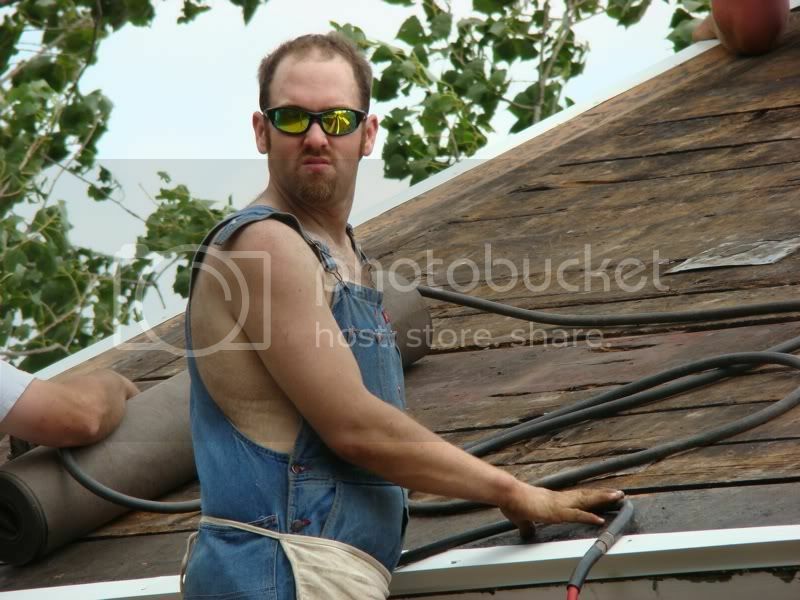 Ha ha man I look so tuff in that pic HAHAHAhAH that’s right maybe next weekend we will have more help from the ladies . You guys can give me all the crap you want but I was nice and cool. Keep it coming as you can see I have big shoulders . 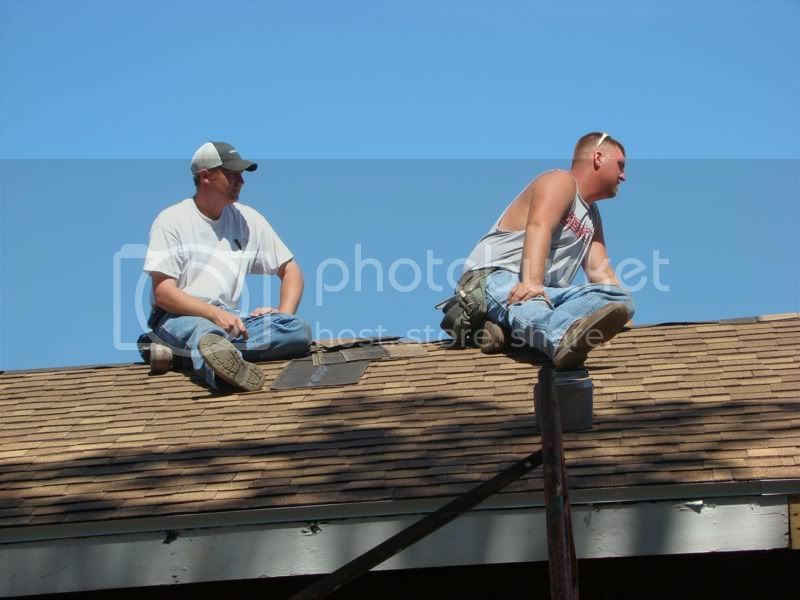 But on a real note S.D Jon, Yancy and I striped the roof Saturday morning. The plan is too finish the rest next Saturday like Mark said it’s a nice easy roof to work on. Any help would be helpful. Thanks Danger Boy.. I'll get some photos up tonight yet! I have a certain video that needs posting somewhere as well..
Was good to be be able to help out with something other than a camera for an afternoon. I guess Mark learned I knew how to drive something other than a golf cart too! I guess Mark learned I knew how to drive something other than a golf cart too! Of all things to be the "first thing" anyone ever drove at Rollag, that would have been my last guess! You can understand my concern, being in the basket and all! You handled it like a pro Tim! Yup, That was my 'first' thing I learned how.. Maybe Karl was thinking ahead and figured "heck, if Tim can drive this, he can drive anything up here"
Any yeah, safety first up there. I might be slow on the control with people in the basket, but no one falls off hah. Here are a few more pictures of the project from this past weekend. The roof is done! We all got brave and handed Tim Dachtera the nail gun!!! Most of us are on pretty good terms with him, so there was not a lot to be worried about! Kade and Jace Mitchell trying to figure out why the ridge cap color is so far off! Yancy got it all sorted out for us after he got back from his 2 hour break! Mark, I didn't run thru anyone's hand.. 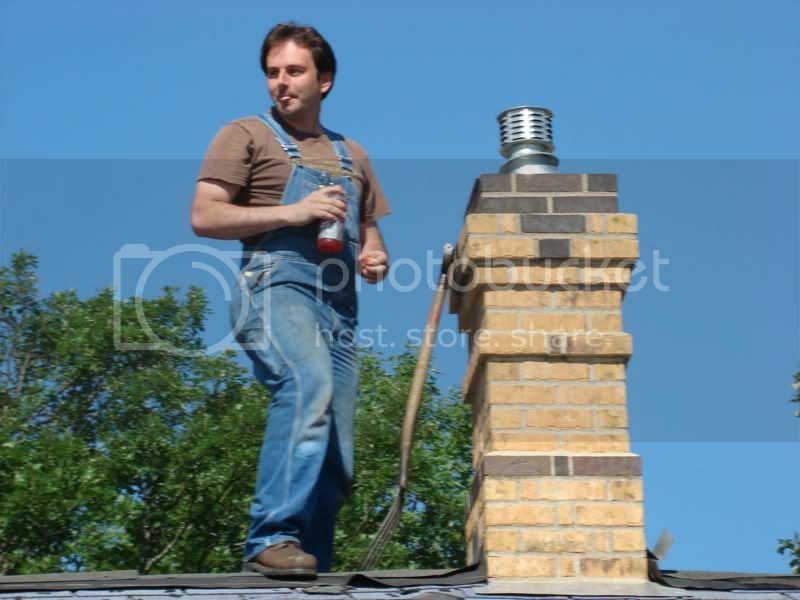 There is still time tho I'm sure hah.. - Little known fact, the last roof I helped with was in 85' when my family built our home, and we didn't have guns.. it was.. LOTS of nails, and hammers.. Does anyone have any info on the current projects with the Hitterdal depot? I can see that it badly needs to be painted and would gladly start the project (June 10th). Just want to get the go ahead and possibly round up a crew. Is anyone already working on this?